We have seen some incredible architectural innovations in Taiwan lately. From the tallest green skyscraper in the world to a 100 percent solar powered stadium, the country is certainly ahead of the game when it comes to sustainable design. STL Architects have come up with yet another eye-catcher: an amazing circular tower for Taichung City. The massive structure will serve as a cultural hub for leisure activities, concerts, and shopping while continuing to raise the bar in green architecture. 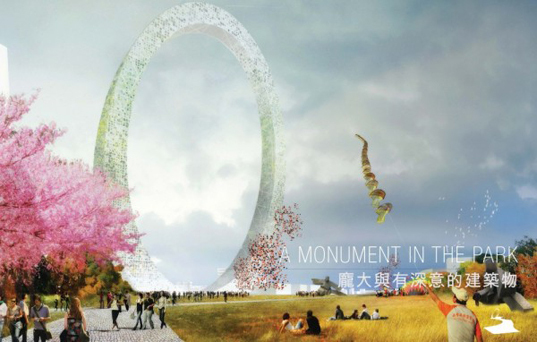 The giant circular tower will soar 1,049 feet high over a grassy plain and various walkways. Meant to promote clean air and the circulation of oxygen, the building’s lobby will consist of an informational museum and vertical green habitats that encourage visitors to travel upward into the crystal blue sky. With a lightweight and airy design in mind, STL created the structure of glass and metal, with an absolute minimal use of material. Special attention was paid to eliminating most of the horizontal structural beams that would otherwise disrupt the view from the panoramic glass encasements. The entire structure is covered in pixilated glazed openings varying from 20 percent to 60 percent to lighten the building and distribute stress equally throughout. The main occupiable areas on both the inner and outer cusp of the circle are double skinned to allow natural ventilation and fresh air throughout the many climbing levels. The centermost areas are clad in additional permeable materials for natural light to tend to the vertical gardens within. The circular tower is a visual surprise, as many would think a delicate, ring-shaped building would fall over. This particular design is rooted with nearly a dozen stories below ground, giving the structure a solid base. The stiffness and thickness of the ring’s bottom levels also give it a low center of gravity, making it easier to withstand heavy winds. The ring does not stand straight up however. Upon a profile view, one can see that the circular tower leans back at the top to balance itself. While this was initially a logistics decision, the leaning top proved to be a great opportunity for an observation deck high above the city. The deck also collects rainwater and maintains a diverse garden for visitors to enjoy. While the design is still in its beginning stages, it is already poised to be a must see attraction to add to the list in Taiwan. 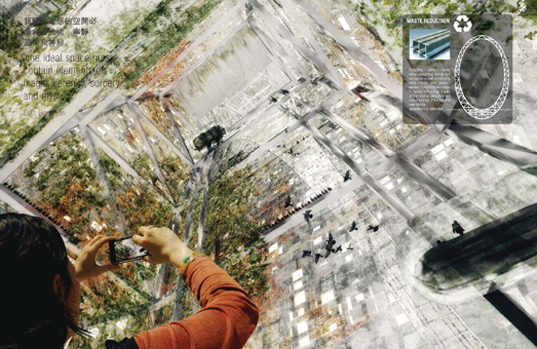 The giant circular tower will soar 1,049 feet high over a grassy plain and various walkways. Meant to promote clean air and the circulation of oxygen, the building's lobby will consist of an informational museum and vertical green habitats that encourage visitors to travel upward into the crystal blue sky. With a lightweight and airy design in mind, STL created the structure of glass and metal, with an absolute minimal use of material. Special attention was paid to eliminating most of the horizontal structural beams that would otherwise disrupt the view from the panoramic glass encasements. The entire structure is covered in pixilated glazed openings varying from 20 percent to 60 percent to lighten the building and distribute stress equally throughout. The main areas on both the inner and outer cusp of the circle are double skinned to allow natural ventilation and fresh air throughout the many climbing levels. The centermost areas are clad in additional permeable materials for natural light to tend to the vertical gardens within. The circular tower is a visual surprise, as many would think a delicate, ring-shaped building would fall over. This particular design is rooted with nearly a dozen stories below ground, giving the structure a solid base. The stiffness and thickness of the ring's bottom levels also give it a low center of gravity, making it easier to withstand heavy winds.